Evolution of Nuclear Receptors and Ligand Signaling: Towards a Soft Key–Lock Model? 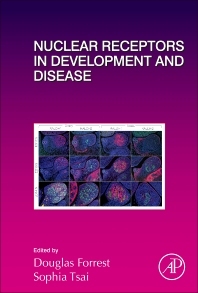 Nuclear Receptors in Development and Disease, Volume 125, the latest volume in the Current Topics in Developmental Biology series, covers nuclear receptors in development and disease, and includes contributions from an international board of authors. New chapters in this release cover the Evolution of Nuclear Receptors and Ligand Signaling: Towards a Soft Key–Lock Model?, The Function and Evolution of Nuclear Receptors in Insect Embryonic Development, Nuclear Receptors in Skeletal Homeostasis, Estrogen Hormone Biology, and the Mechanisms of Glucocorticoid Action During Development. The book's chapters provide a comprehensive set of reviews that cover such topics as nuclear differentiation and remodeling, evolution of receptors, ligand signaling and neural development. Dr. Douglas Forrest is Senior Investigator at the Laboratory of Endocrinology and Receptor Biology, National Institute of Diabetes and Digestive and Kidney Diseases (NIDDK) National Institutes of Health (NIH). Sophia Tsai is Professor - Molecular & Cell Biology, at Baylor College of Medicine in Houston, Texas.